Papa's Burgers recently opened in Market City Shopping Center and offers an array of differently-styled burgers. This isn't your usual burger joint- Papa's features burgers such as their BiBimBop Burger, Baja Burger, Miso Pork Burger, Pork and Shrimp Thai Burger. All very unique in name and taste. Brian and I arrived around lunchtime on a Sunday, after we were told the wait for Sweet E's was going to be 45 minutes long. Sweet E's and Market City are only minutes away from each other, so we thought we'd try to see if we could get into Café Kaila, another popular American breakfast/brunch place. But, we couldn't even get in there! They were even more crowded. Thus, we settled on Papa's Burgers, which looked inviting with its brightly colored interior and no line. They also had illustrations and descriptions of each of their burgers on the outside window, which was helpful in deciding whether to eat there or not. When we sat down, we were greeted by a Korean-accented young girl who kept coughing. I was immediately turned off. If you're working at a restaurant that serves food, PLEASE skip work that day! Or skip work until you're not contagious anymore. I surely don't want to enjoy a nice burger from your restaurant, but then come down with a cold after that! I not only give the girl a thumbs down for not taking responsibility, but the owner and cook should know better. This is an establishment that serves food! Come on! Besides that, I asked her which burger was more popular and what she'd recommend. I usually do this when I'm on the fence between two items and want to get a little input from my waiter/waitress. She immediately mistook what I was saying and thought I was ordering both burgers. She could barely understand me, plus seemed a little flighty in taking care of all of the tables she was in charge of (mind you, she was the only waitress working that day). She brought our drinks late, forgot water...it just seemed a little too much for her to take care of everyone in a timely manner. Not her fault. I know it's newly-opened, and restaurants like this need a little, what I call, "warming up." I just wish the owner gave a little more thought about this. As for the burgers, Brian really enjoyed his Miso Pork Burger, while I left half of my BiBimBop burger. To me, the burger was creative, but poorly executed. Honestly, it left me craving a Stone Pot Bi Bim Bap from Angry Korean Lady! On a good note, I really enjoyed their crispy fries that came in a bucket with a side of their special spicy mayo sauce. Not very spicy at all, but it had some bite. Really good. All in all, it was great to try (Thank you, Kory, from My Kinda Grinds for the rec! ), though I will sadly not be back. 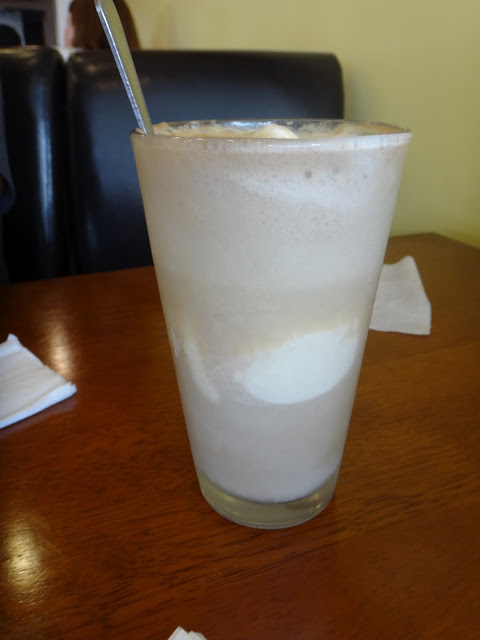 Coke Float- they had no Root Beer! Insides of the BiBimBop Burger- egg was too cooked- I would have liked it to be gooey and oozing. I can't wait to come back next month. I'm def gonna try AKL!!! Yippee!